Nellie McClung was born Nellie Mooney in 1873 in Ontario. The family moved to the Souris Valley in Manitoba when McClung was seven years of age. Her parents were among the early homesteaders there. She began school at the age of 10 and finished at 16. Then, after a few months at Normal School in Winnipeg, she started teaching. She married a druggist, Robert Wesley McClung, in 1896 and they had four sons and one daughter. McClung's first political involvement was with the Women's Christian Temperance Union, a group that was campaigning to have alcohol prohibited. Excessive drinking by men was seen to be the cause of a lot of family trouble and abuse. The temperance: moderation, in this case with alcohol. The principle and practice of not using alcoholic drinks at all.temperance movement became closely associated with women's suffrage: a vote; the right to vote.suffrage because without the vote women realized they could do little to influence political policies about alcohol. When McClung first tried to get signatures on a petition for women's rights, people just laughed at the idea. But she persisted. In 1914 she rented the Walker Theatre in Winnipeg and staged a mock parliament with herself in the role of prime minister and men in the position of begging for the vote. Her portrayal of the pompous premier, Rodmond Roblin, won over the audience with its wit and humour. The production was a big success, both financially and politically. In 1916 a women's suffrage bill was passed in Manitoba. McClung then moved to Edmonton where she was elected to the Alberta legislature in 1921 and worked on the famous "Persons Case." Until 1929 Senate seats were open only to "eligible persons" according to the constitution: A constitution is the system of fundamental principles according to which a nation, state or group is governed.constitution and the Supreme Court ruled that women were not "persons" and therefore not eligible for appointment to the Senate. McClung and several other women led the fight against this archaic notion. McClung was also a writer. She entered one of her early stories in a short story contest and later developed it into a novel, Sowing Seeds in Danny, which sold 100,000 copies and was a bestseller in 1908. When she was older she continued to write novels and social criticism, especially against the economic dependence of women. Her 1935 autobiography, Clearing in the West, gives a wonderful personal description of pioneer life in western Canada. In 1938 she was appointed to the Canadian delegation to the League of Nations. 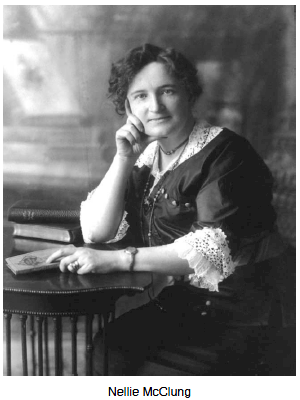 Nellie McClung died in Victoria, B.C. in 1951.